You can also join the campaign to remove Confederate monuments and learn more about the history of white-supremacy movements in the United States. Take Action Now gives you three meaningful actions you can take each week—whatever your schedule. This week, we’re sharing some ways that you can plug into movements for racial justice, including today’s day of action to defend DACA and immigrant youth. You can sign up for Take Action Now here. For more on what you can do in the wake of this weekend’s events, check out our article from yesterday. Make one phone call and write one social-media post in support of today’s day of action to defend DACA. 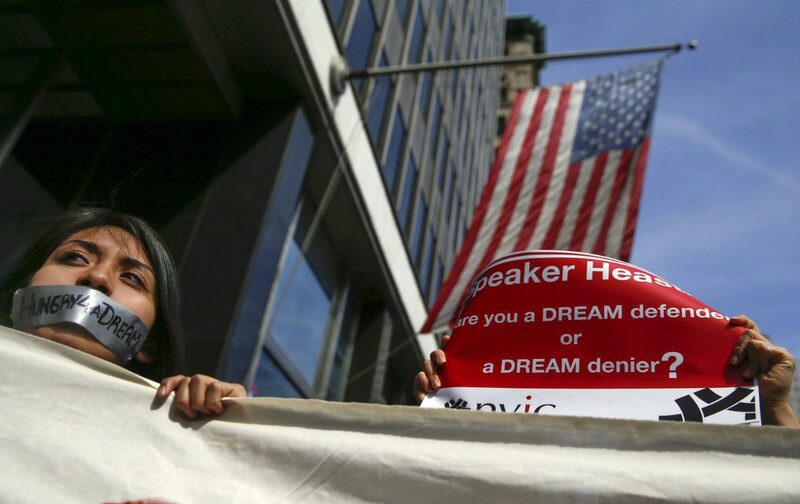 Today is the fifth anniversary of the Deferred Action for Childhood Arrivals (DACA) program, which allowed undocumented immigrants brought here as children protection from deportation. The program is in grave danger, as anti-immigrant Republicans have threatened to sue if the Trump administration does not end the program by September 5. To fight back, people across the country are rallying today in support of DACA and immigrant youth and families. You can support them by calling one of the elected officials listed on the Defend DACA website (they also provide a script for you) and posting a message of support on Facebook or Twitter using the hashtag #DefendDACA. Join the campaign to remove all Confederate symbols in the United States. If you know of a Confederate monument in your town, call your local government to demand that it be removed. The Southern Poverty Law Center has a community-action guide for beginning a local campaign that includes pointers for responding to common objections (something that is useful whether you’re responding to elected officials or in a discussion with your neighbors). Even if there is not a monument near you, you can sign and share ColorofChange’s petition to remove them all. Learn about the history of white supremacy in the United States and arm yourself with the knowledge you need to fight back. Students at the University of Virginia’s Graduate Student Coalition for Liberation have created a syllabus that lists articles and books that give historical context to the white nationalist gathering in Charlottesville, and people across the country are sharing even more resources using the hashtags #CharlottesvilleSyllabus and #CharlottesvilleCurriculum. You may also want to check out The Nation‘s Collier Meyerson and Mychal Denzel Smith on why fighting white supremacy means confronting our own history.